Join Kumari for a very special, one-of-a-kind wild Animal Communication retreat with the dearly loved exotic Big Cats of Panther Ridge Conservation Center —Amos the Black Panther, Charlie the Cheetah, Cody the ocelot, Ming & Suki and other rare clouded leopards, jaguars, a several, several cougars, as well as several small domestic cats who really rule the place. Deepen your connection with animals and all of Nature in a beautiful Big Cat sanctuary set in a verdant tropical paradise. This retreat is appropriate for all levels, to begin your journey to connecting telepathically to animals, through to the more advanced student looking to refining their skills and deepening their awareness. Expect a deeply transformative and life altering experience as we open the wisdom of the Divine Intelligence flowing through Big Catness. 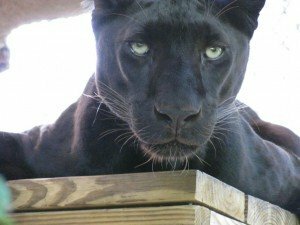 Panther Ridge is a home for rescued or abandoned animals that are not capable of living in the wild, and a safe place for humans to interact with them. As we have been holding animal communication seminars here for several years, the cats have opened up tremendously. These encounters create a deep transformative sense of the connection between humans and the larger community of life. Read more, and register, here!